While I'm a fan of anime, I don't watch "those" kind. I would get into anime more if it weren't for the excessive fan service. Even "good" anime still does it and I don't like it. Not sure you're doing this right: you're supposed to be getting off to it rather than into it. 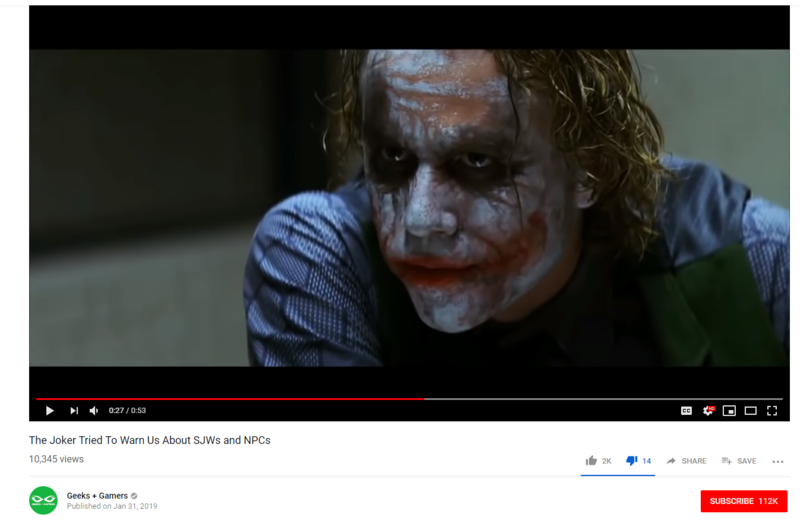 Considering that the guy who shot up that movie theater in Colorado had modeled himself after the Joker, I'm not sure it's a good idea to channel this character in order to feed mentally deranged teenagers apocalyptic conspiracy theories about SJWs. I don't know what it is about gaming that attracts such terrible people. Hmm. Well, can you think of any other expensive, time-consuming, unproductive hobbies that attract terrible people? Games make people terrible, duh. Look, let me put it this way. Like, that's a whole pile of privilege heaped right up on there. Video games are basically useless. Nothing that you do or learn in a video game matters, and no skills you learn will transfer in any meaningful sense. I mean, I enjoy them too, but video games are just a pastime. It's not like a hobby or learning a skill where you build up your self worth in a way that matters. And if video games are your all-consuming interest, like it is for a lot of these kids, their self worth is on a pretty shaky foundation tbh. Video games are the best way to waste thousands of your precious few hours alive on the planet. Those "THE CRIMINAL WAS RIGHT!" videos made by, well, those who'd identify with criminals are always amusing. Freaking Americans and their American Internet terminology. That said, those types are prevalent here as well, but they're 99% likely to focus their outrage on Arabs instead of Democrats or what have you. Last edited by Nikumubeki; 02-03-2019 at 07:14 AM. That said, while making TODOA and DXN didn't benefit me at all in real life, I still count them as my greatest achievements without a question. I was excoriating passive consumption of video games as a form of personal identity. Making and modding games requires a lot of skill, both creative and technical. The skills are useful and you can be proud of the result. Even if it's only in the tiniest possible way, you've made the world a better place by the act of creation. Racist high schooler's sick fortnite wins ain't nothing to nobody. To be extra clear on this, I'm also not saying playing video games is bad. It's just candy, is all. Video games are like a Marvel movie you can be bad at watching. If someone based their sense of self worth around forcefully consuming Marvel movies, you'd probably think they were an idiot. People who do that for games aren't any different. Oh, yeah, I sort of extrapolated from that to my own directions (as I often do). Didn't mean to imply anything other than the standard FGR "In 2013, I actually did think there could have been more" moanings. And yes, to think that the kids born the very moment this strip was published managed to become worse than the person depicted in the comic is quite regrettable. It's like how I mentioned on this thread or some other one, back in 2004 you kind of had to dig for these types but now their videos are automatically suggested to you by YouTube regardless of what you were watching. I just finished the three main storylines in Assassin's Creed - Odyssey. To me, this game is an astounding achievement and Ithoroughly enjoyed it, just when I thought I would never get back into gaming. I will say, it may be just me, but I did switch into grind mode at about 50 hours in. Still, a masterpiece. I'm playing AC - Origins now. I've been playing through the Spyro remasters. It might just be a case of I only played the first one as a kid so I've not got the same sense of nostalgia, but they're getting more of a chore as they go on. Ha! Yeah it can definitely be like that with some old ones. I, like Tenshu, have been playing AssCreed Odyssey. It's really good, depending on what you mean by good. Playing as Kassandra is a must, **** Alexios. The voice actor is great, and while the character is a bit of a blank slate except for "will I be bloodthirsty or will I be compassionate" in dialogue options that don't really affect the plot, she has a consistent, clear personality that is just enough to make her likable and to carry the dialogue and narrative stuff. For me, AssCrOd is basically a big roaming around simulator. I'll probably lose some degree of interest once there are no new locations (cities, giant statues, neat lakes, hidden caves, shipwrecks, forests, etc. ), so I'm trying to balance the amount of roaming and main quest stuff I'm doing. Also, I played about an hour of the Anthem open... beta... demo... thing, and boooooooooooooooooooooooyyyyy oh boy. Is that a good "boy oh boy" or a bad "boy oh boy"
I think that already happened after the release of Mass Effect 2, when Bioware turned from "acquired by EA" into "(another cancerous growth of) EA". IMO, Mass Effect could have been the sci-fi thing of the 21st century if ME3 (mainly the endings) hadn't been screwed up by EA (things like Origin exclusivity etc. didn't help). Odd to think that ME3 is still mostly pretty similar to current games, yet was released 7 years ago - the length of time between 2012 and 2019 being the same as the time between JK and Unreal Tournament 2004, for example. 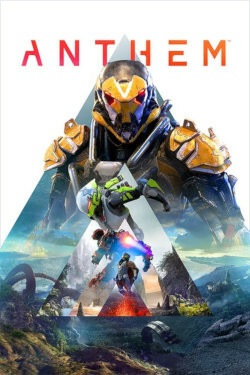 Well you know what happened but yeah, Anthem is looking... pretty dodgy at the moment, and it might be the nail in the coffin for Bioware. Ah, I didn't see anything in the news so I was confused. Yeah, BioWare went bye bye a long time ago. It's fun watching gamers turn into Nazis when capitalism takes away their heroin supply. I resurrected my joystick (well, my father's joystick, but to be completely honest I just bought it for him so I could borrow it for myself) and started playing X-Wing again. Boy, oh, boy, such a good game. But boy, oh, boy, so hard at times. I almost managed to finish a very hard mission on my tenth try but then died due to a stupid collision during a dogfight. Haven't touched it since. I tried setting up my x52's again because I wanted to get back into War Thunder, but they've finally bitten the dust. So now I have a Thrustmaster T16000M, with throttle and pedals.